Let me start by saying that I'm actually wearing something from J.Crew. Yep, if ya know me this comes as quite a shocker. Don't get me wrong. I love this store, their selection and their styles. I just don't love their prices. In fact, it kinda makes me dizzy thinking about buying a skirt for $100. I typically don't spend more than $40 on any single piece of clothing besides shoes, bags and jackets. It's how I am programmed. I would rather pick up four things from H&M, Target, Old Navy and of course Forever 21 than just one higher priced item at another retailer. You guys know I shop. More than I should. And because of my extracurricular activities, I'd like to believe I have some sorta clue about "what's out there". And, I just don't see that huge of a difference in quality between the more expensive pieces versus more affordable ones. Maybe I'm wrong. Maybe I'm not. Maybe I'm just cheap. Anyway, ramble over. My point being, I randomly hit up J.Crew and at the perfect time. This skirt was on clearance with an additional 30% off last week. I thought it was a great transitional piece that could be worn all year. It was a little more than my typical $19.80 skirt from Forever 21, but I couldn't pass it up. I am trying to be smarter about my purchases lately. I am leaning toward more things that I can remix and wear different ways. So, viola, this little number came home with me. Annnnnnd, for your viewing pleasure, I conjured up a way to take a regular, very THICK scarf and turn it into an infinity one. Normally, I can tie the ends together to a scarf made of lighter material and be just fine. Not so much with a heavier one. I tried tying the ends of this red one together and it left me with a big bulky mess in the back. So, I came up with this little cheap trick. Wrap it around the ends of the scarf. An infinity scarf was born without the junk in the trunk. I sure do love me some simple, easy peasy tricks of the trade. Don't you? Got any of your own? Do share! **Linking up with Molly & Carly. I have the same problems with my chunky ones! I tie every other one together. Never thought of this little trick, thanks! Hi there. Happy Monday and a Good Week Ahead!! I knew I recognized that skirt!! Looks great!! What a great scarf trick! Love the J Crew skirt on you... their sales are the best! Love this idea for the scarf! I always tie mine in a knot and then it's so hard to get undone. You are so darling, btw. I LOVE that skirt! And I totally agree with you about J. Crew. I LOVE their stuff, but they are sooo expensive. I never buy anything there either. Oh how I adore that skirt! But yes, I agree with you about the prices. I normally hit up j crew when they have a major sale or I avoid it at all costs, since I know I would fall in love! And great trick! I am so going to do that today! "without the junk in the trunk". Hilarious! OHHHH good trick!!!!!!!! I'll be using that one! 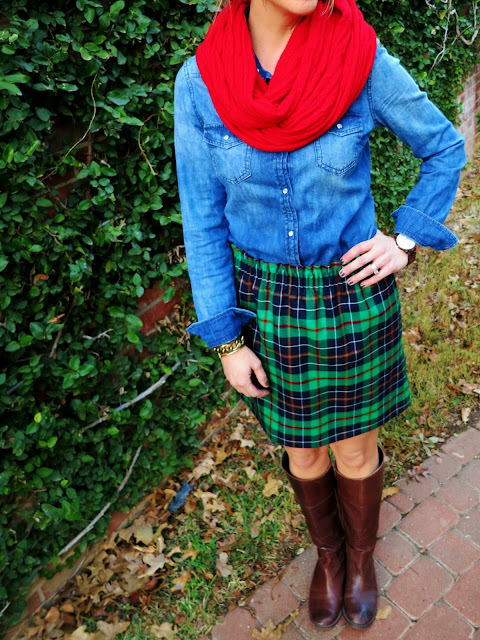 Oh that skirt is such a great piece - love the colors of the plaid! I'm like you with shopping - I hate spending more than I think I need to - great find girl! i love that skirt! and what a great idea to tie the scarf! I usually look at J. Crew and then go somewhere cheaper in search of a knock-off! That skirt is a total score!! Adorable! Love the scarf trick. I'm gonna have to try it. The skirt is so adorable!! I hate spending too much money on one item! I mean, the best things tend to pop up for a cheaper price all over the place anyway! Lately I've been trying to make an effort to buy more work related pieces at more quality stores (though never at full price)... hopefully they last! OMG! I just instagramed a request on how you tie your scarves. That is too funny! I just read this and think your outfit (LIKE ALWAYS) is adobs and loving the scarf trick idea. P.S. I have a very hard time purchasing over priced items.... I love the idea getting more for my money. I guess that is why I have discovered consignment stores lately. Of course I would never give up my fun stores but every now and again I will hit up consigment for some fun pieces. I love the infinity scarf trick, so easy and cute! I am with you on J Crew, or anywhere like Madewell. So stinking cute just waaayyy too pricey! I love me some H&M and F21! 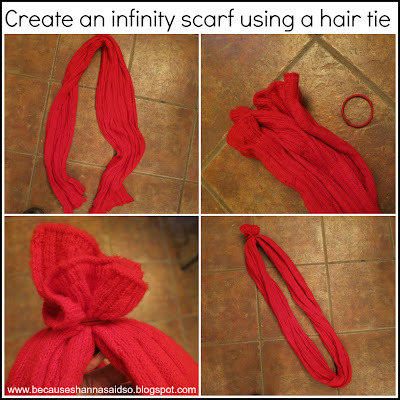 Love your infinity scarf how-to! Brilliant! Very cute outfit! Glad you found such a good deal at J Crew! WHAT a good idea! I am in love with this outfit as usual. That skirt is amazing - maybe I need to find it! I know what you mean about J.Crew. I LOVE every single thing they make, but can't afford to buy it. J.Crew Factory is a little better price-wise but I wait until there's a major sale to get anything. Ummm...thanks for the genius infinity tutorial! I will definitely be trying this out! Awesome! I love J.Crew and that's even better that you got such a great deal on it! That skirt is definitely a year-round piece! And I love what you did with the scarf! I LOVE this outfit! You always put together the cutest things. And great idea with the scarf...I have struggled with this exact same thing so many times! I love your collection of denim shirts, and seeing all the different ways you wear them! What a great outfit! I love how you always find such great deals! I also love the infinity scarf creation! I tied a knot in one of my scarves but agree with having to much in the back! I am definitely going to try your trick my friend! this is so cute and i adore your boots! Soo jealous you scooped up this skirt! By the time is got to the sale rack at my JCrew, they didn't have my size. Love the way you styled it! GREAT idea about the hair tie! i can TOTALLY see why you snagged up that jcrew skirt. it's PERFECT and so gorgeous! i am the SAME way - i have a lot of stuff from jcrew but i have NEVER paid full price - i ALWAYS get their stuff on major sale. and seriously? SUCH a genius idea with the infinity scarf. GENIUS i tell you. Great tip! Love love love that outfit! Your hair tie trick is genious! I'll be trying that with some of my scarves. There are some stores that I only shop sale and clearance items- Jcrew, Gap, Bannana Republic, and Anne Taylor to name a few. Like you, I just can't justify $100 for one item, unless it's a coat or boots. I'm LOVING plaid right now, so of course I think that skirt rocks. And your scarf-tying trick is awesome, thanks! Great idea on the scarf, I usually tie them too, so didn't even try a chunkier scarf. I totally will now. I'm with you on JCrew. I love everything a out them but the prices. This skirt is so cute Nd glad you got it at a price you can handle! That is an awesome quick fix. I'm going to have to try it on my new leopard scarf. Yes, I said leopard scarf. It's okay. You can be jealous. what a great trick! I try to avoid J Crew unless I recently got my paycheck .... to dangerous! Seriously, are we the same person? I hate spending more than $40-50 on any piece of clothing and I typically try to stay in the $30 and under range. I can't remember the last time I set foot in J.Crew. But you look adorable and you can't beat a sale on top of clearance! And fab trick with the scarf, doll! I think you are the queen of scarves. How many do you have? I'm so curious!! I totally agree with you on prices. If I can get it for less money (hello F21!) then you know I will! Love the scarf trick! Normally I go into J Crew and then get sad because I can't afford a single thing in there! I love it Shanna!! I was in love with that skirt--looks fabulous on you! I wish now that i had gotten it, boo!! What a great idea with the scarf! And I love that skirt! I love good deals too, so I just stalk items til they are marked down enough for me to pull the trigger:) I hope you have a fantastic 2013! 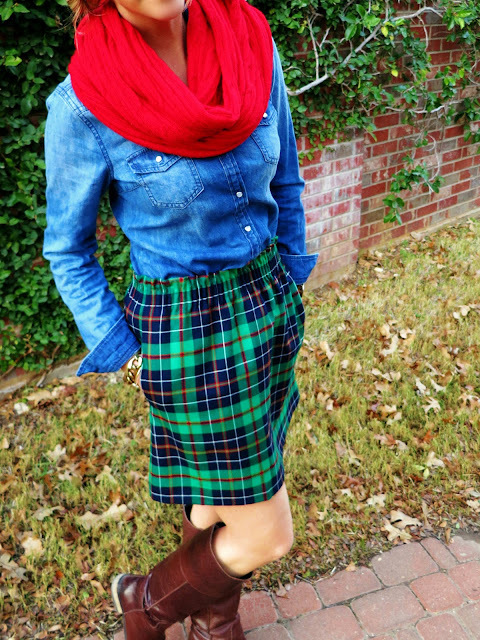 That skirt looks amazing on you and I love how you added the red infinity scarf to highlight the color in the skirt and add a pop to your outfit. GREAT idea! I love J Crew too, but rarely even go into the store, because I don't want to fall into the pricey temptation. Great outfit! I know...I love J.Crew and I'm always thinking that I'm going to buckle down and buy something from there but I just can't do it!! So expensive! I do shop at J.Crew Factory when they have mega sales. Love the scarf trick! I might be trying that soon! I love the scarf idea! Cute outfit! I love your skirt. I also love that idea with the scarf. I was wondering how I could do that. Love the school girl look! I know how you feel about J.Crew...but they do have good quality stuff. I have 3 pencil skirts from there and I love them for work. Awesome idea on the scarf! I actually did that with a scarf a few weeks ago and it did the trick! I don't own anything from J. Crew either because their prices are just too high for me. I am love that skirt though! Love the skirt, you styled it perfectly! Love seeing an alternative to putting a knot in my scarves. I think I'll use a tiny clear band next time! I want your top stat! That scarf tip is amazing!! I've always just tied the ends which doesn't always work. Gorgeous skirt too!!! You can wear it so many different ways. When I was in college many moons (or 15 years) ago, you could get two JCrew sweaters for $50 - they regularly ran free shipping and $25 off $75 specials. Now you can't touch anything there for that. I'm not sure who they think they are, but I can't buy anything from there anymore unless it's on sale. I do still have a weakness for their flip flops. LOVE this look!!! The colors are perfection. omg how am i just now finding your amazing blog!? This outfit is perfection. you look like you just walked out of a j.crew magazine. That skirt is an amazing find, I love it!! Love the look! For lots of good items during the J Crew 30% off sale!! I do this all the time with my scarves! It just makes so much more sense that buying separate infinity scarves. But I do think your skirt was an awesome find! Love it! What a great skirt! The colors really brighten you up. Love this trick!! i am trying it! !